Reprinted from Alex Saviuk’s Facebook page with permission. 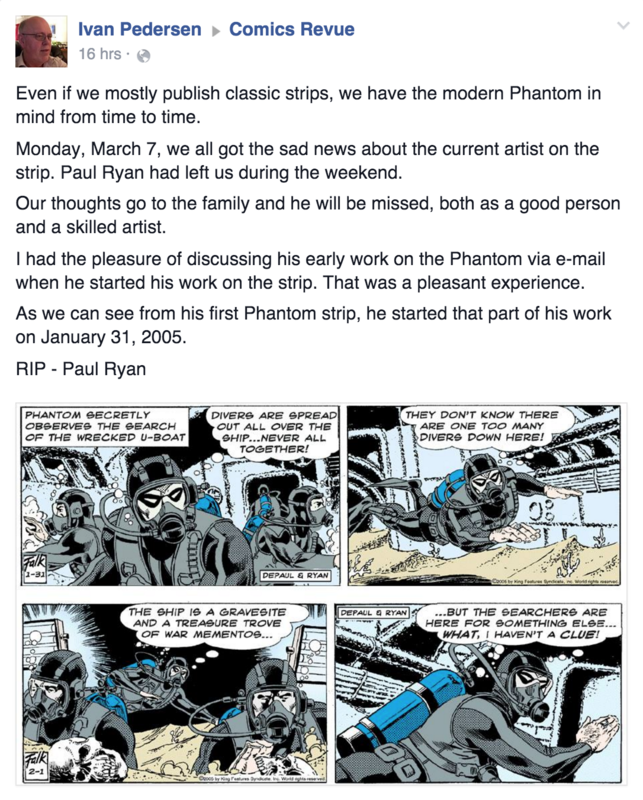 I am deeply saddened and stunned by the passing of Paul Ryan so quickly and way too soon. I found out yesterday late morning and could not work anymore and had to make inquiries as to what happened that took him away from us and more importantly from his wife and immediate family. I was able to speak at length with some close friends to share in our grief but at the same time revel in delight at what a wonderful guy he was and of course terrific artist he was as well. When I got to Marvel in 1986 Paul was just breaking into comics and he and I worked together on a NIGHTMASK fill-in in which he inked my pencils, but as time went on very quickly he became more prolific as a penciler and storyteller with an incredible work ethic that left many of his colleagues scratching their heads in awe. 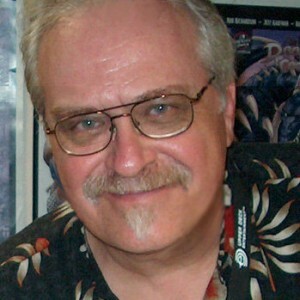 At his peak he penciled the Fantastic Four and an Avengers book every month without missing a beat or sacrificing quality because of the sheer volume of work that he did religiously day after day with joy. 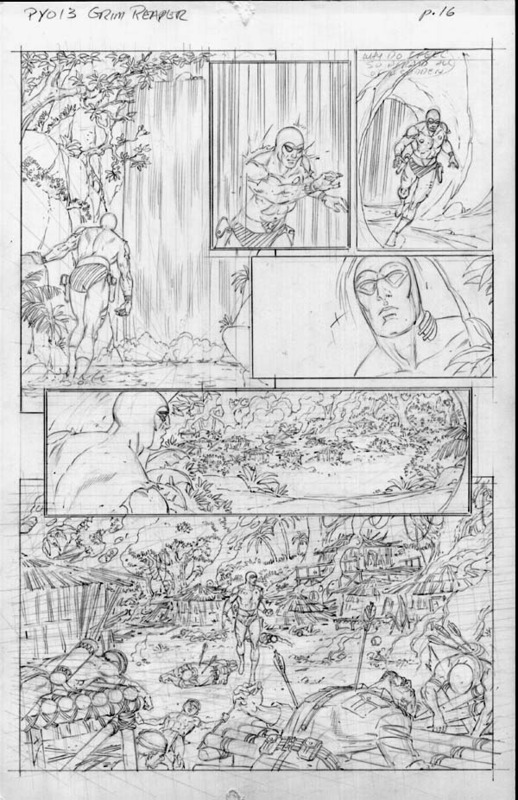 Even to this day he penciled inked and lettered the Phantom Daily strip without assistants and still just recently finished penciling and inking a Phantom story for Egmont overseas. 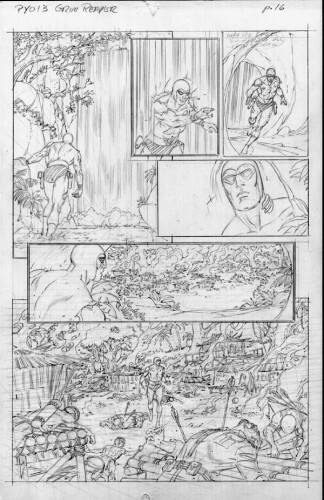 I got to see his work first hand because his was the first part of a three part story and I needed to see his pages since I was drawing the second part. That was the last time I will have seen Paul Ryan…through his wonderful work. I wanted to call him and talk to him about how he managed to fit this into his already incredibly busy week but I didn’t which I now regret tremendously. I already miss that conversation that never happened. But I did speak with a mutual friend last night, Pete Klaus, who did manage to speak with him just a few days ago and things seemed well enough for the most part. I am happy about being instrumental to some degree in getting Paul to Australia in 2014 the year after I was there so he could meet the adoring fans in that beautiful country and I know how appreciative they were that he and his lovely wife Linda made the trip. As far and as long as that trip was Paul made it back home and got back to work as usual. This latest trip unfortunately will be his last from which he will not return in person…but the body of work that he left behind will be an everlasting legacy along with the many memories of the truly wonderful man he was. Rest in peace, Paul… You will be a hard act to follow. 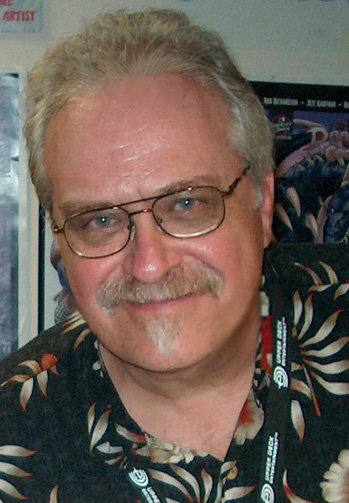 Alex Saviuk has worked for both DC and Marvel Comics – he currently draws the Amazing Spider-Man Sunday comic strip. 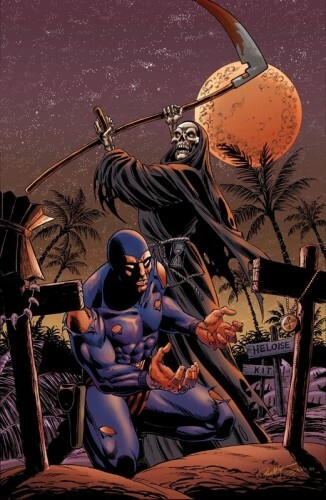 From Marv Wolfman’s Facebook page. From Joe Rubinstein’s Facebook page. From Ivan Pedersen’s Facebook page. 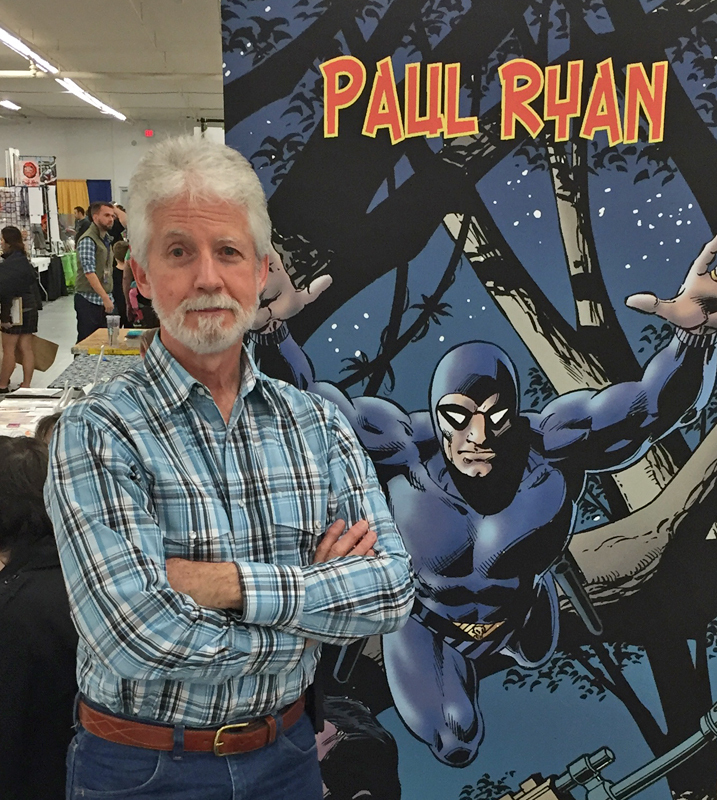 2015 Overstreet interview with Paul Ryan by Jason Versaggi. 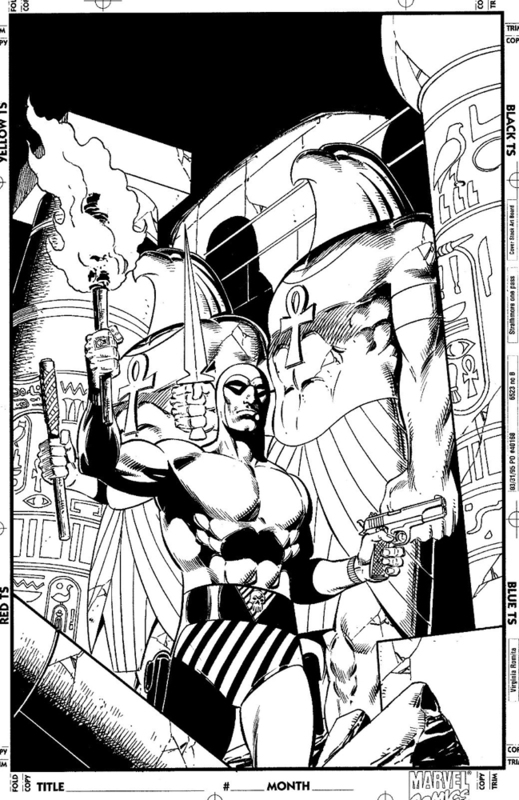 -Source of preceding Phantom pencils and inks. 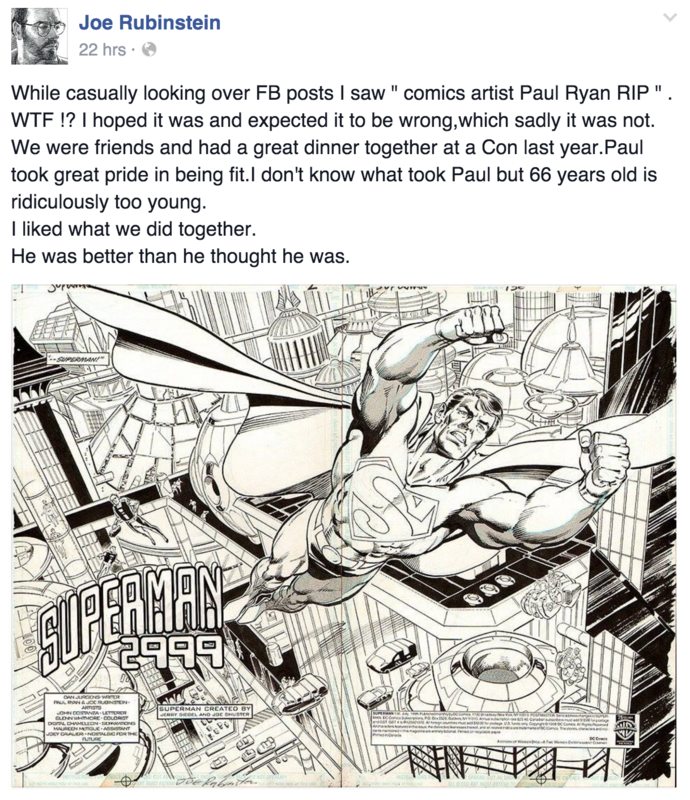 This entry was posted in Paul Ryan and tagged Alex Saviuk, Paul Ryan. Bookmark the permalink.